With three goals in two games, Nazem Kadri appears to have finally busted out of his well-documented slump. Kadri played 21 games between Nov. 29 and Jan. 23, scoring only two goals and three (three!!) total points. Worse, one of those goals (Nov. 30 against the Edmonton Oilers) was an empty-netter and the other (Jan. 4 against the San Jose Sharks) went in off his skate. So, for nearly two whole months, Kadri did not manage to actually shoot a puck directly into the net with a goaltender between the pipes. Thankfully, things seemed to have turned around for the 27-year-old, who has slammed home net-front two tallies in two straight games. However, it’s the third goal of the bunch that leads me to believe things have really turned the corner; Kadri’s turn-around shot Thursday evening in Dallas pinballed off two Stars and behind Ben Bishop. If that’s not puck luck, I don’t know what is. So, now that it’s all over, why was Kadri slumping in the first place? Last season, Kadri was paired with Leo Komarov for most of the campaign, with either William Nylander or Connor Brown filling out the line on most nights. 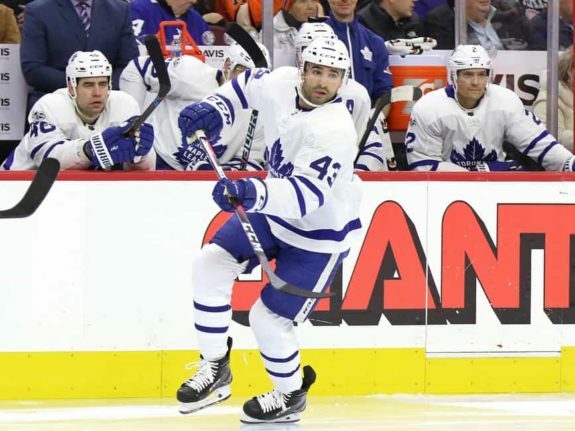 This season, Kadri has played the majority of his time with…Leo Komarov, with either Nylander or the newly acquired Patrick Marleau occupying the third spot. Interestingly, Kadri’s two slump-busting games have seen him line up alongside Marleau and Mitch Marner, which looks to be a dynamic trio that Babcock will be hard-pressed to disassemble. Nevertheless, by and large, the line combinations Kadri has been a part of this season have been remarkably consistent, and are much the same as last season, as well. So it’s not as though he was playing with unfamiliar or incapable talent. His ice time and usage (zone starts, for example) did not differ significantly, either. The pucks just weren’t going in. Let’s also not forget how he started this campaign. Kadri had 59 shots in his first 26 games (2.3 per contest), scoring 12 times along the way, an astonishing (and highly unsustainable) 20.3 percent conversion rate. In the 21 games of his slump? 57 shots (2.7 per game), but only two goals, for a horrendous (and unlikely to continue) 3.5% shooting percentage. So, it’s possible Kadri’s numbers just needed some time to come back down to Earth. It’s also worth noting he’s still sitting at a 13.7% conversion rate for the season, substantially above his 11.2% career average coming into the campaign. Kadri isn’t tremendously off last year’s scoring pace either, with a projection of 28 goals (versus 32 last season), though his projected assists (18, versus 29) and points (46, versus 61) are way down. That said, the Leafs as a whole have had trouble scoring for the past couple months and the scoring they do have has been spread out more, due in large part to the arrival of Marleau. Still, it would be nice if Kadri were more consistent, not only for the team, but also for the sanity of the fan base. Is Kadri Prone to Slumps? If this sounds all too familiar, that’s because it is. 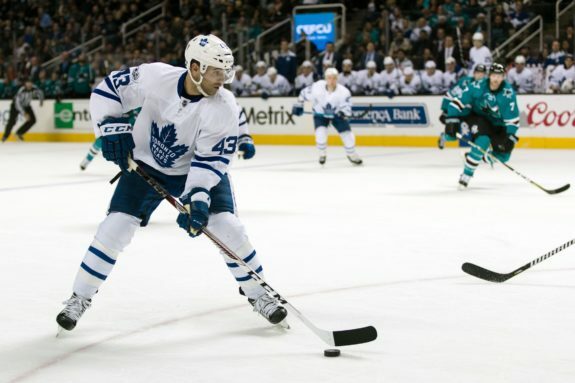 Kadri took a long time to establish himself in the National Hockey League, only making the Leafs on a full-time basis his fourth season after being drafted seventh overall in 2009. During his development, Kadri would show flashes of brilliance (mostly offensive) in between long stretches of, well, not much. That said, it should be noted he played for Randy Carlyle, who seemed to dislike him, and Ron Wilson, who seems to dislike the world in general, two experienced coaches who, nevertheless, both lacked the necessary patience and skillset to develop young players, particularly those with Kadri’s level of self-confidence. Current Leafs head coach Mike Babcock, since his arrival ahead of the 2015-16 season, has done a far better job harnessing the London, Ontario native, moulding the once defensively suspect Kadri into an effective two-way centre, meaning he can can contribute even when he’s not scoring. But even Babcock’s coaching could not smooth out Kadri’s streakiness. Back in 2015-16, Kadri, relied upon heavily on a talent-deficient Leafs team that went on to finish last, endured goal droughts of seven, nine, 11 and 15 games. He finished the season with 17 goals, good for 126th in the league, despite ranking 12th overall in shots (260). It was a miserable year for the Leafs in general, but for Kadri in particular, who really played rather well. He just couldn’t put it away, quite literally; his shooting percentage was just 6.5% (461st in the NHL), well off his career average up until that point of 12.5%. On the bright side, for Toronto anyway, Kadri’s statistically disappointing season enabled the Leafs to re-sign him to six years and only $4.5 million per season, not bad at all for a guy who rebounded in 2016-17 with 32 goals and 61 points, a 15-goal (and 16-point) improvement. Slumps or not, Kadri has shown the past couple of seasons the commitment and maturity required to be a great NHL player. One hallmark of great players is their willingness and ability to constantly improve. For Kadri, he’s shed his reputation as a defensive liability and become a legitimate two-way threat, centring the Leafs’ shutdown line (or what qualifies for one in that stacked forward corps). He’s improved his faceoff percentage nearly every season since entering the league. He’s constantly making adjustments to his shot in an effort to stay one step ahead of opposing goaltenders. If Kadri can maintain this recent spurt of offense, there will be simply no stopping the Leafs down the stretch. Maybe he isn’t so “difficult” after all.